While there are some pieces of office furniture that are used frequently, other pieces are more aesthetic pieces than functional pieces. There are also pieces that can double as both a functional piece and an aesthetic piece. An office bookcase can be used to store important records, showcase small décor items, and hold important reference materials. So how should an office manager choose an office bookcase? The first thing to consider is what the office bookcase will be used for. If you plan on using it to store and display your reference books and materials, consider a bookcase that is sturdy and made from a high quality wood. This will prevent your shelves from bending in the middle due to the weight of the books. If you don’t plan on storing heavy items on your office bookcase, you can choose a piece that isn’t a durable. You should also consider finding a bookcase that allows you to customize your shelves to accommodate tall items. You also want to consider the amount of room you have to work with in your office space. 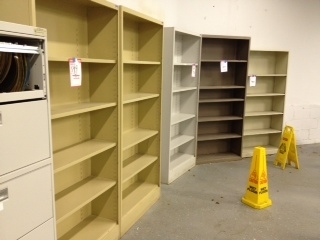 You don’t want to purchase an office bookcase that will be too large for your office or conference room. Taking up too much space could create a cramped and cluttered work environment. You also want to consider the interior design layout you have already established in your office. This will help your new office bookcase blend in with your interior design rather than stand out poorly. This entry was posted on Friday, October 30th, 2015 at 5:47 pm. Both comments and pings are currently closed.